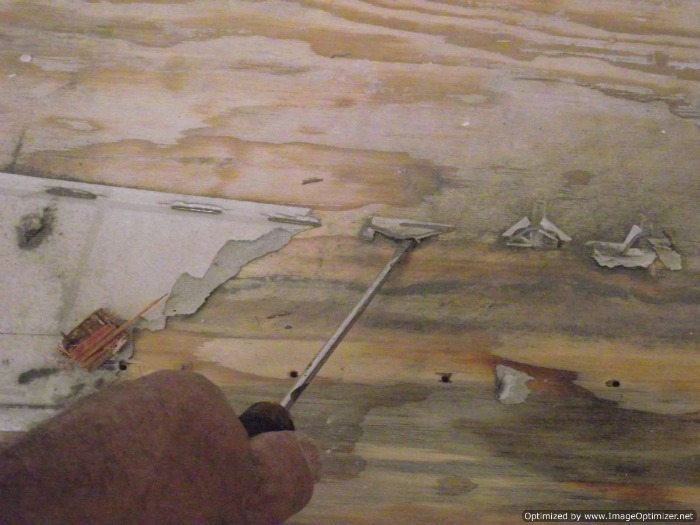 In mobile homes removing vinyl flooring can be a little time consuming. I seem to run across this a lot. I go to start a laminate job in a mobile home and after ripping up the carpet I have this hump of vinyl flooring loaded with these over sized staples. If I am laying the laminate flooring over this hump it can affect the way the laminate lays. 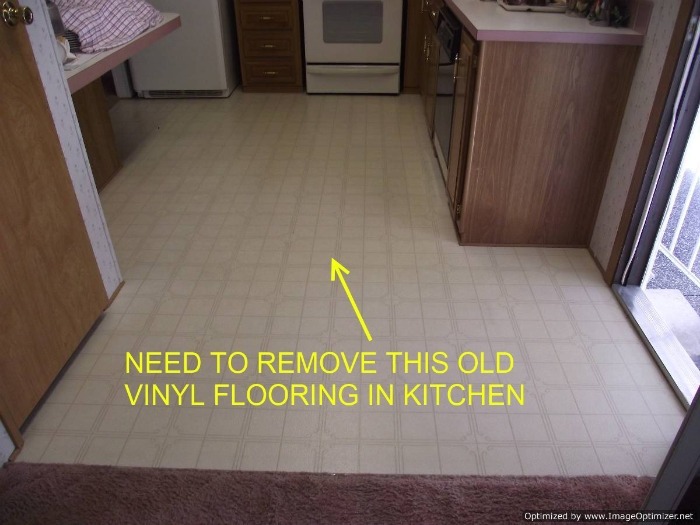 Most often I have to remove the vinyl flooring. 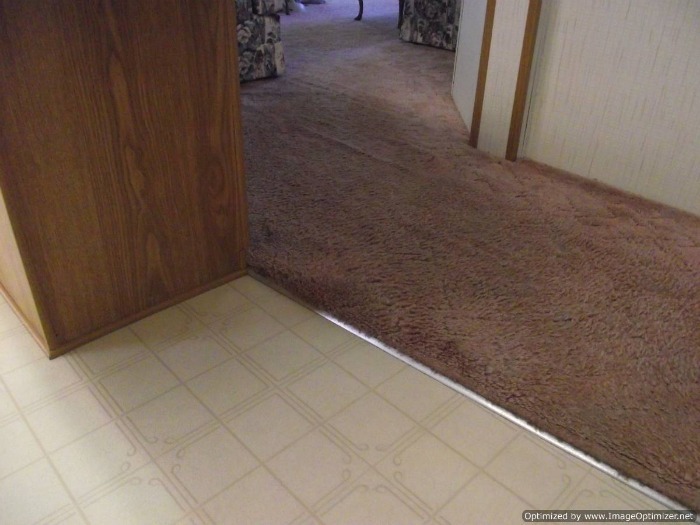 If the vinyl flooring in the mobile home is glued it can be hard to take up, mainly because you can't use a scraper to scrap on a wood floor. If thats the case you may have to leave it down. This kitchen in this mobile home needs to have the vinyl removed first because the laminate flooring being installed here is also going to go down the hallway. The vinyl flooring stops at the hallway, and this would create a hump if the laminate flooring were installed over it. This is the rest of the kitchen. Use a utility knife and cut along the walls after removing the old shoe molding. Cutting the vinyl in smaller pieces makes it easier to handle. 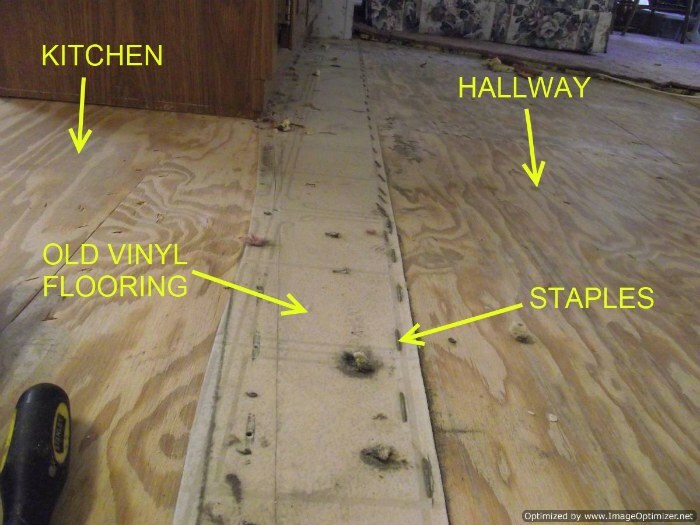 Here is an example of the staples along the edge where the old vinyl flooring stops. 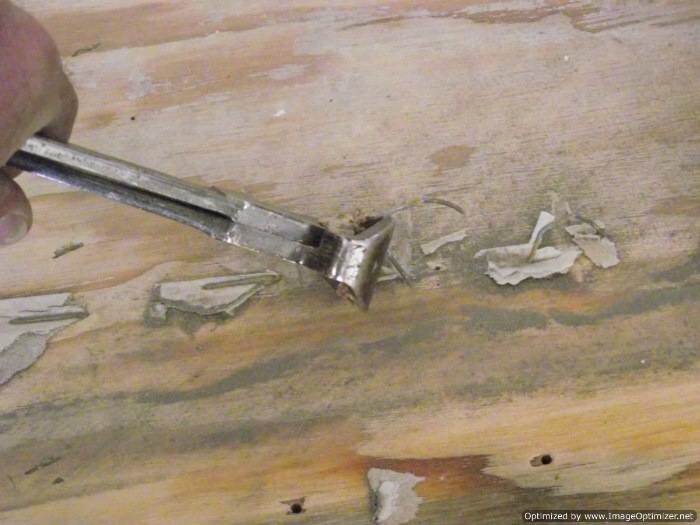 In this case the laminate will be installed parallel to this row of staples. If you try to bang the staples down with a hammer, they don't bang down too good because there is vinyl under them. So the best thing to do is remove them and be done with it. I use a thin screw driver and a hammer to get under the staple, pry it up a little. Use a pair of nail pullers to pull the staple out. It can be a little time consuming , but it will be a much better installation without humps to worry about.